The Beatles began recording A Day In The Life, with the working title In The Life Of..., on 19 January 1967. Two days previously, however, two stories were published in the Daily Mail newspaper which provided John Lennon with inspiration for the lyrics. Lennon wrote the song at a piano in his home Kenwood, while reading a copy of the day's newspaper. One article inspired the song's first two verses: a brief news item reporting the coroner's verdict into the death of Tara Browne, the 21-year-old heir to the Guinness fortune. 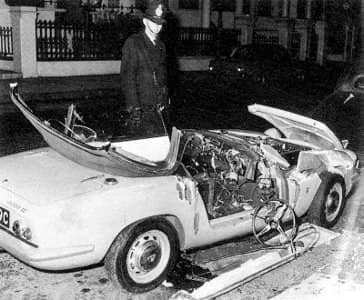 Browne, a close friend of Lennon and Paul McCartney, had crashed his Lotus Elan car on 18 December 1966, after failing to notice a red light. The accident happened in London's South Kensington; the car collided with a stationary van in Redcliffe Gardens after swerving to avoid an oncoming Volkswagen car. I was writing A Day In The Life with the Daily Mail propped in front of me on the piano. I had it open at their News in Brief, or Far and Near, whatever they call it. I noticed two stories. One was about the Guinness heir who killed himself in a car. That was the main headline story. He died in London in a car crash. In Hunter Davies' 1968 authorised biography of The Beatles, Lennon explained how the words of the song were indirectly inspired by the events. I didn't copy the accident. Tara didn't blow his mind out. But it was in my mind when I was writing that verse. However, in his 1997 authorised biography Many Years From Now, Paul McCartney downplayed suggestions that the song was directly about Browne's death. The verse about the politician blowing his mind out in a car we wrote together. It has been attributed to Tara Browne, the Guinness heir, which I don't believe is the case, certainly as were were writing it, I was not attributing it to Tara in my head. In John's head it might have been. In my head I was imagining a politician bombed out on drugs who'd stopped at some traffic lights and didn't notice that the lights had changed. The 'blew his mind' was purely a drugs reference, nothing to do with a car crash. The song's final verse was taken from the Daily Mail's Far And Near column. 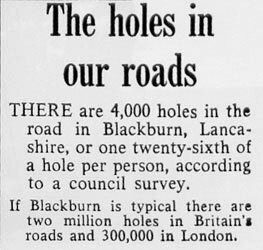 "There are 4,000 holes in the road in Blackburn, Lancashire," it read, "or one twenty-sixth of a hole per person, according to a council survey." There was still one word missing in that verse when we came to record. I knew the line had to go 'Now they know how many holes it takes to... something, the Albert Hall.' It was a nonsense verse really, but for some reason I couldn't think of the verb. What did the holes do to the Albert Hall? It was Terry [Doran, a former car dealer and friend of Brian Epstein's who later became head of Apple Music] who said 'fill' the Albert Hall. And that was it. Perhaps I was looking for that word all the time, but couldn't put my tongue on it. Other people don't necessarily give you a word or a line, they just throw in the word you're looking for anyway.